Bitter Heat ~ A Marmalade with Kick! Now, that we are here (in Florida) and surrounded by all that southern goodness…you know the kind I mean; the oranges, lemons, limes, grapefruits, peppers, and all other colourful heat loving fruits and veggies, we just can’t stop ourselves from making some of our favorite preserves. Last year, we made one batch of this marmalade which equates to approximately eight 250mL jars (1/2 pints)…not a lot but a lot when you consider we make about 20 different kinds of marmalade each year; it’s enough or at least that’s what we thought. But, one year later we’ve consumed each and every jar, leaving us pining for more! I can honestly say this one was a big hit and made our top 5, right between our favorite grapefruit marmalade and our pineapple ~ lime. It was one of Matt’s favorites because it packs the fiery heat he loves. For me, it borders on having too much heat but it’s a good kind of heat, the kind only habaneros and good scotch whiskey leave behind…if you know what I mean!?! It’s a heat that comes from behind but doesn’t burn the entire mouth. Wash oranges and lemons well. Place one small plate and several spoons in the freezer to check for doneness later on. 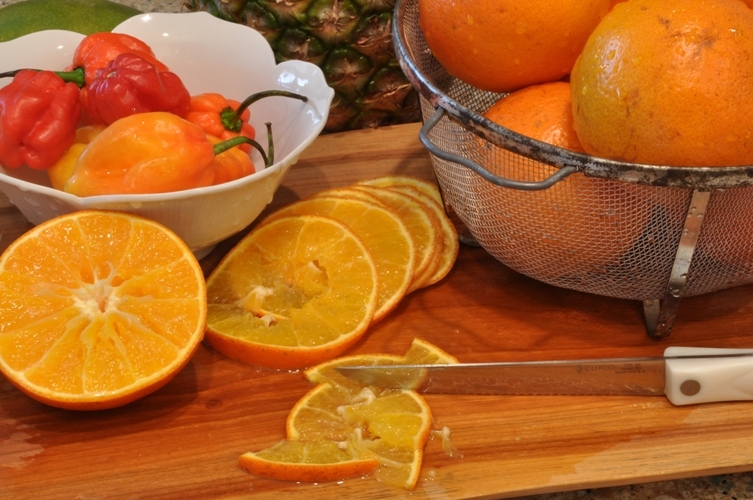 Slice oranges into thin strips and then quarter. 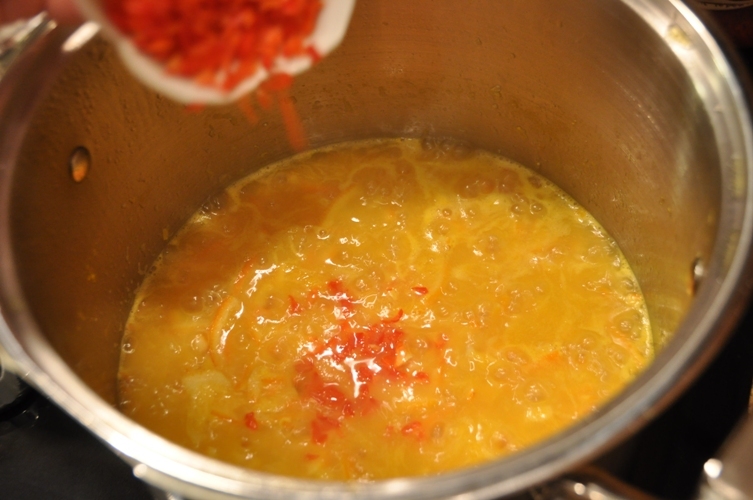 Combine oranges, lemon zest and juice and water in a large stainless steel saucepan. Bring to a boil over high heat, stirring constantly. Reduce heat and boil gently, stirring occasionally, for 40 minutes. Meanwhile, cut habaneros into fine pieces on a separate plate. Note: We always use a separate plate when cutting any kind of hot pepper and wearing gloves is also a good idea. This way you can be sure not to contaminate your cutting board and skin with that burning hot intensity these peppers pack. Add habaneros. Partially cover the pot and continue boiling for approximately 30 minutes, stirring occasionally. Add sugar, stirring to combine. Boil hard, stirring occasionally for approximately 10-15 minutes or until mixture reaches gel stage. After about 10 minutes test for doneness using your frozen plate and/or spoons. Ladle hot marmalade into hot sterilized jars, leaving 1/4″ headspace. Remove air bubbles and adjust headspace, if necessary, by adding hot marmalade. Wipe rim with a damp paper towel. Center lid on jar. Screw band down until resistance is met, then increase to finger-tip tight. Place jars in canner, ensuring they are completely covered by at least 1 inch of water. Bring to a full rolling boil and process for 10 minutes. Remover canner lid and wait 5 minutes before removing jars. Check seals, label jars, and store in a cool space for up to 1 year. 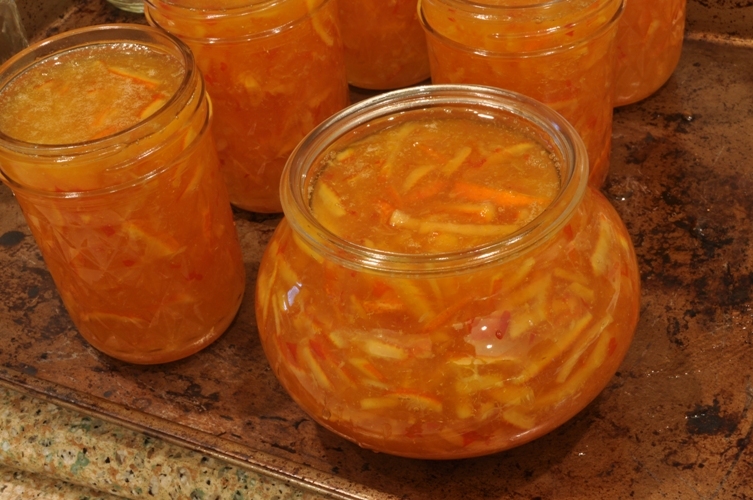 This marmalade can pack as much or as little heat as your taste buds can handle. 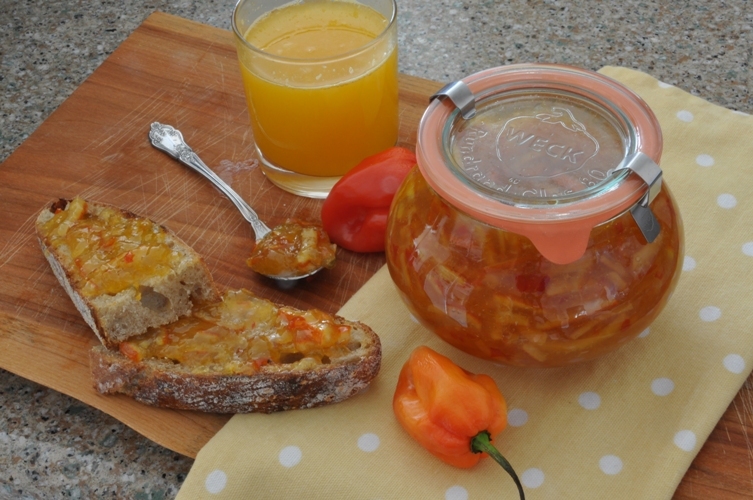 If you like a marmalade with kick (or should I say punch) than, this is the one for you! If not, try it anyway using a milder pepper or by cutting back on the number of habaneros. Be sure to watch this one carefully as it approaches the final stage and start testing for doneness early. When using as much sugar as this recipe calls for it can set up a lot quicker than you’d expect. We may have over done it a little!?! Thankfully, this is one of our favorites and we will be making a second batch. 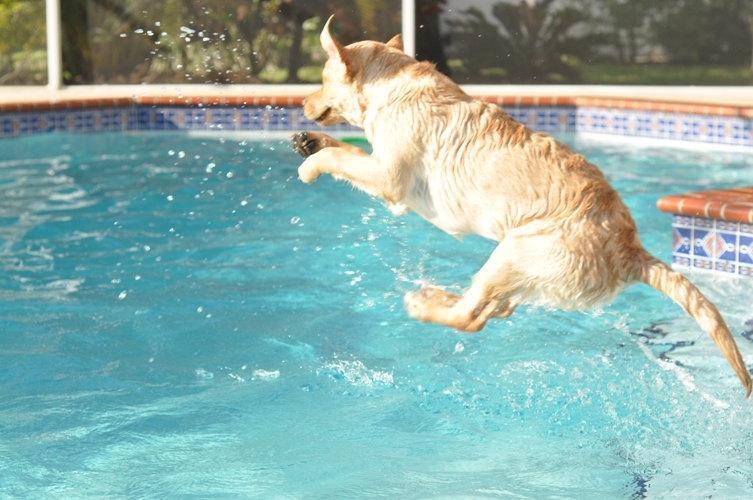 Day two and our pup is taking to the water like most labs do ~ he’s all in! Is it possible you forgot to mention lemons in the ingredients list? Yes, thank you for catching this. We used 2 small lemons or you could use 1 large lemon. WOW did you say 20 different kinds of Marmalade! This is my 1st year making marm and I am loving it. Saturday is going to be another marm making day and this one sounds amazing. The Vanilla Grapefruit marm I over cooked and it is sticky, chewy but still tasty. Live and learn right! I am still amazed at 20 varieties! I know it’s a lot but we use it on and in so many things ~ it’s great to have on hand. Matt loves to use the marmalade in cakes, as a glaze, or to make a quick sauce (as well as on toast). 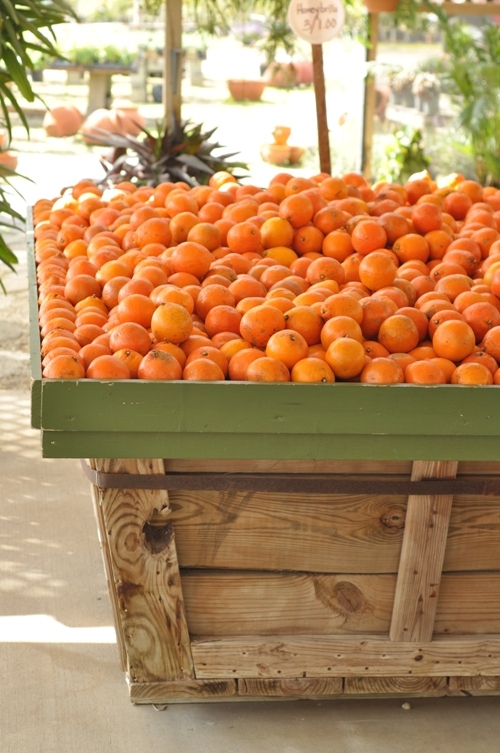 When we’re in Florida (staying and visiting my mom) we get kind of carried away….all that citrus calls out to you and it’s so affordable! Although, we haven’t tried any of Shae’s recipes ~ they all look divine and she is a real perfectionist so I can only imagine how tasty they are. We are going to have to try some of them! Oh wow, the color is stunning! I love that there are habaneros in this recipe. Don’t forget to make candied peel while you’re at it! I made a spicy chili version for Christmas giving and it was a huge hit! Are the carambolas (star fruit) in? I love those things and have been wanting to do a preserve with them but they’re just too darn pricey in the stores here. I remember popping them like candy by the bag from a roadside stand as a kid on vacation in FL. I think there’s an exotic marmalade flavor to be had there! Great idea. Right now you can get starfruit 2 for $1. I’m not sure if it’s a good price but you may be on to something with trying them in a jam or marmalade. Candied peels are the best. We made some for x-mas gifts too! A big hit. If we get time we’ll make some more. Thanks for the suggestions! I love the idea of marmalade heat. I just participated in a jam exchange with Beeloved Jams and she makes the same type of marmalade. AMAZING! When we arrived we had a late Christmas with family. My sister surprised me with not 1, not 2, but 6 boxes of Weck jars. All different shapes and sizes. I was near in tears. I’m not the kind of girl that gets excited about girlie things but giving me preserving supplies (especially these Weck jars) and I’m reduced to tears! Great action shot of the pup! oh, this sounds amazing!! I will definitely try this. My brother in law sends a box of honeybells every year around this time. Didn’t have honeybells, but just made this with some sweet oranges I had access to. Little bit scared of that much heat, so used one orange habanero and one red jalapeno. Taste tests have been VERY gratifying. Oh, and I ended up with a whopping 10 half-pints (though last one is a little skimpy on rind). Woot!